Hey guys and ladies. I would say this will be a quick introduction, but my posts rarely end up that way! I do a lot of walking between October and February and invested in a pair of Meindl Bhutan instead of the usual wellys. Wow, they transformed my walking comfort and now are used regularly for dog walking as well. I started watching a few Youtube videos on the AT and PCT and got hooked on the idea and started looking at hiking in the UK. I found myself quickly becoming a couch walker (hence the username) until I found a channel by a lady called Abbie Barnes, her infectious enthusiasm made me realise I was a couch walker and actually got me off my backside and starting to do hikes. I am still a long way from a hiker, but am gradually increasing the distances dragging my wife and springer spaniel along with me. Strangely, neither of them are complaining! Anyway, I have set myself a few goals, they may seem simple to a lot of people on here but are basically, Ben Nevis, the Pennine Way, Coast to Coast and maybe the Three Peak Challenge. More are getting added weekly as I discover them. looking forward to chatting with you all as I progress on my hiking journey. A springer spaniel will keep you out and about. Why do you only walk between October and February? 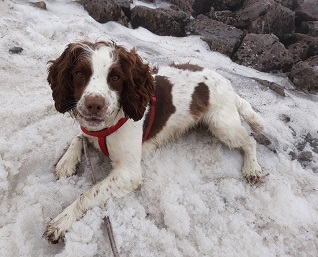 Sorry, that wasn't very clear, I do walk at other times due to the springer, it's just during those months I do roughly 15km per day, 2 or 3 times a week. Hello also from Hampshire.. North Hampshire near Newbury.. I have just completed the Test way in sections and plan on doing it as a Long Distance Walk but at 45 miles it's a pretty short one.. Why don't you give it a look at ?? Thank you! Just found it on the Hants Gov website. That would be perfect as I'm not far from Longparish and used to eat at the Cricketers regularly a few years ago. I've also noticed Wayfarers Walk marked on the map starting from Inkpen Hill as well. I must admit, I have lived here for years and never realised what quality walking routes we have round here. Hi Couchwalker, welcome from the south coast north near Portsmouth. The Wayfarers passes within 100 ft of my garden. I've walked whole and section of these . I used to live in Hampshire. I walked the Wayfarers Walk in 4 separate sections over a few weekends, starting at the coast. It is well worth exploring as the scenery varies significantly over its course. Welcome from Portsmouth. I used to live in Newbury 30 years ago, terrible traffic problems then, the same now? Another welcome CW form Portsmouth. By my count you're the fourth Hampshire resident on the forum - double the number of National Parks! I've through walked most of the routes RBW has mentioned, backpacking along the way. If you want a long circular route the Test & Solent Ways and Wayfarers Walk form the Hampshire Triangle. Apologies to everyone for not responding to the new welcome posts, it's been a busy few months for me with loads of changes. So a belated thanks to you all. The traffic is a lot better since the A34 was finished, you can now drive through during the day reasonably quickly. Rush hour is still a nightmare though.